Regular readers of the blog will know that I occasionally getupdates about the fishing in New Zealand from my pal Alan Bulmer. Well this time Alan excelled himself mentioning a wonderful boat trip where (almost) everything seemed to go right for them. I'd sent him a couple of Sandra lures to try for snapper but they clearly weren't the thing on this occasion. So, I replied - "Fascinating! What a session - I don't think that the Sandra is the thing for kahawai or kingfish (or even snapper) given the feeding frenzy and the nature of the prey. In fact it sounds as though a big livebait was the preferred option. I'm feeling quite envious. I think that the Sandras are really designed for fishing slowly near the seabed for things that might eat eels, squid or worms. I look forward to your expanded account". Glad to see you are feeling quite envious hopefully it will be enough to spur you on to travel to fish in NZ soon! I awoke yesterday morning to the sound of rustling leaves and an intermittent rattle from a locked back door. The pattern is getting almost too predictable this summer. Plan a day on the water and up springs the wind from the SW overnight. The marine forecast predicted 15 – 20 knot gusts but by the time I’d driven to the marina, via the supermarket, the wind was gusting 25 knots. On the plus side, the wind was warm but the overcast conditions and grey clouds massing on the horizon were an ugly portent. At the pre-departure briefing Bruce Duncan outlined our options and thought that targeting kingfish later in the day may be an option as there were plenty in the harbour at present. We left the marina at high tide and headed out to the Rangitoto channel. This involved a fairly circuitous route as we had to skirt the course marked out for the Louis Vuitton yacht match racing series that is being held on the Waitemata harbour. Yesterday was semi-finals day and the “gin swigging” spectator fleet was out in full force. 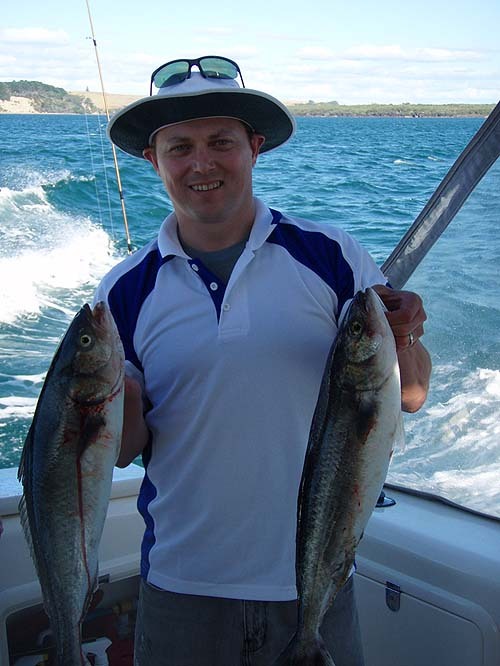 Bruce and Peter expertly surveyed the conditions and decided that the best starting plan was to anchor the boat into the wind and fish from the stern into a shallow reef close to the shore of Rangitoto island. They positioned the boat expertly and proudly announced that it would be necessary to lob the messy pilchard baits about 30 metres astern onto the edge of the reef. The water depth under the boat was only 6 metres so the reef must have been close to breaking at dead low tide. Within seconds baits hurtled into the target area and almost as quickly a steady stream of small – legal - snapper found their way to the transom. Stuart and I opted to fish soft plastics from the side of the boat and it was very difficult to get the lures onto the reef as the wind kept on blowing them across the lines from the stern. Bugger! Eventually after an hour or so the team at the stern scaled down their efforts, tempted by coffee and hot cross buns (should have thought of it earlier! ), which allowed us to get a couple of casts into the target zone. I was using an Atomic jighead prawn and it was getting chewed endlessly but no matter how I retrieved the lure hook ups were impossible. Stuart remained bite and fishless and was using Sassy shads in a variety of hues. For the first hour and a half we amused ourselves watching the racing yachts in between casts. After a couple of hours the conditions worsened as a rain front swept across Auckland. The decision was made to move around Rangitoto lighthouse to the Tiri facing side of Rangitoto island to avoid the rain and get some respite from the endless SW gusts. This was a brilliant move as once in the lee of the volcanic cone the wind was manageable and parallel to the shore there was a 200 metre wide band of calm water. Peter opted for one drift along the edge of the calm water before we prepared lunch and “team soft plastic” was at the bow with rods poised even before he cut the motors. I’d opted for a Zoom white ice lure on a ½ oz jig head and it was monstered on the drop by a decent snapper. Line was wrenched from the spool in short spurts as the fish dived back down to the sea bed but the relentless drag pressure and powerful rod soon put paid to any resistance and a 2 ½ lb fish was brought to the net. The next 3 casts all got spanked by snapper but only one was legal and it was a mirror image of the first fish landed. The next couple of casts brought hits but no hook ups and by then the lure was shredded and needed replacement. I threaded on a new lure, cast upstream of the drift and let it sink to the bottom. The lure bounced on the floor and was absolutely spanked. Line poured from the spool as the fish headed away from the boat. This fish was no snapper as the line started to quickly angle up to the surface. It was a kahawai and a big ‘un. It broke through the surface like an Polaris missile and spent the next few minutes charging all around the boat, airborne and shaking its head like a demented bulldog. Magic! Eventually I managed to get it under some sort of control but every time I turned its head to the boat it fought back and pulled away with all the power it could muster. Eventually the runs became slower and it was drawn to the boat for netting. Six pounds of muscle and aggression. While this was going on everyone was hooked up and landing snapper on the 2 – 3 lb mark. Good fish, hard fighting but nothing spectacular. Then as soon as it had started it stopped. We retraced the drift but couldn’t get any more action. By now everyone was hungry so Stuart and I prepared lunch. Rotisserie Chicken (stuffed with Sage & Onion), fresh crusty bread, a selection of pesto and dips, smoked chilli mussels, smoked salmon and salad. This was followed by seasonal fresh fruit and a cheeseboard. Lunch took about an hour but while we were eating gannets started working about 1 kilometre away. They were clearly feeding and something was forcing the bait fish (anchovies) to the surface. After a while it became too much to watch and we hastily cleared away the lunch dishes while Peter motored over to investigate. When we arrived at the work up and cut the motors to drift into the action it was apparent that there were a lot of big fish cutting a swathe through the tightly balled baitfish. There were bath tub sized swirls from XOS kahawai and kingfish all around the boat and an endless stream of diving gannets peppering the water from on high. Lines were baited and dropped over the side and everyone hooked up almost immediately. Those that got hit early found themselves attached to huge kahawai and those who managed to get through the startled baitfish ended up being spanked by 3 - 4 lb snapper. It was carnage. Peter opted to drop the anchor to stay in amongst the action and I waited until the boat settled before tossing my Zoom lure into the amassed bait school. It would not have travelled 10’ under water when it was butchered by another 6 lb kahawai. This fish took to the air and made a huge commotion before proceeding to wrap itself around the anchor chain. I bent over the bow with the rod to free the line when 3 huge kingfish (~ 30 lb each) materialised and started to jostle the kahawai which panicked and hit the afterburners. The rod was stretched in an arc around the chain and the guides were by now beating a tattoo on the metal links. Somehow I managed to free the rod and keep in touch with the fleeing kahawai and its tormentors. The kingfish were relentless and eventually one came up behind the kahawai, opened its huge maw and engulfed it. All Stuart and I could see at that point was the kahawai’s head. We were willing the kingfish to swallow the fish completely but it grabbed hold just behind the gill plates just as the kahawai made a desperate bid for freedom. There was a shower of scales as the kahawai broke free and headed under the boat. 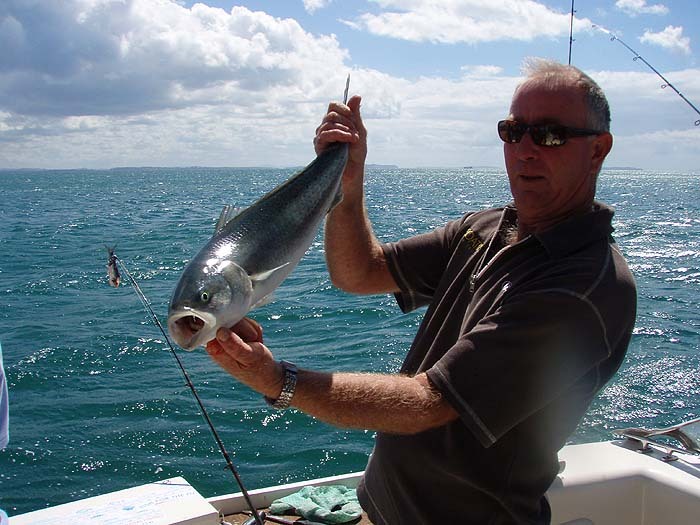 The kingfish did not follow and we were able to quickly bring the kahawai to the boat and release it. The water was alive with baitfish and it looked for all the world like a huge underwater reef, such was the density. We upped anchor and drifted through the school for about an hour catching kahawai to 8 lb and snapper to 5 lb. Despite our best efforts we could not snare a live bait to tempt the kingfish that were constantly ghosting about the boat just on the edge of sight. It was unbelievable. All too soon it was time to go home but none of us wanted to leave. We were still catching and releasing fish with almost every drift. What a day. Hard to believe we were fishing within sight of the largest city in the county. Final score was about 18 fish kept between 6 of us on board. Soft baits would have only accounted for about 15% of the fish caught during the day but soft bait caught fish represented about 40% of the total fish kept. We are off out again on Tuesday, weather permitting. It would be brilliant if the fishing was as good again. Must go as have got to get ready to go to Queenstown. How about that! It was worth reading just for the description of the meal. A bit different from the flask of undrinkable copy and (if I was lucky) tinned tuna sandwich on my boat trips.